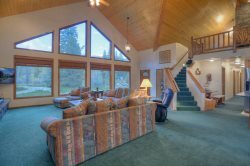 This condominium is one of the few true skin-in, ski-out accommodations at Durango's Purgatory Resort (formerly Durango Mountain Resort). This 3 BR, 3 BA includes 1 king, 1 queen/twin bunk, 1 full/twin bunk and a 2 twin bunk. Washer and dryer are in the condo. Fireplace in living room. Ski lockers are on rear deck just outside the rear door of the condo. Upper-level condominium adjacent to parking area. Access to exterior hallways, ski lockers adjacent to the individual condo. Security code accessible hot tub deck, plus Gazebo with outdoor tables, gas grill, fire pit. Immediate access to ski run behind the complex via a catwalk and stairs directly behind building. Walking distance (five minutes) to shops and restaurants at the Purgatory Resort Plaza. Drive time to and from Historic downtown Durango is about 25 minutes. Purgatory Resort, previously Durango Mountain Resort, is under new ownership, with the addition of new ski lift, and other guest-friendly improvements. Hot tub hours are 10:00am to 9:00pm. Respect for mutual enjoyment of the property is expected. This was a very nice stay for me and my family. Marie was on point with the condo, and the property manager Chris could not have been more friendly. We would absolutely stay here again! Everyone was easy to work with and the manager at the condo was very nice and accommodating when we needed a little extra time to check out. We enjoyed our time here and would recommend it to others. A deposit on 25% is due at booking and the balance is due 30 days prior to your arrival date. If you are booking inside of 30 days prior to arrival then the total amount is due at booking. Check in is at 4pm and check out is at 10am. Rental Damage insurance is non- refundable and can be purchased instead of paying a security deposit. CSA Travel Insurance now covers lack of snow at ski resorts.